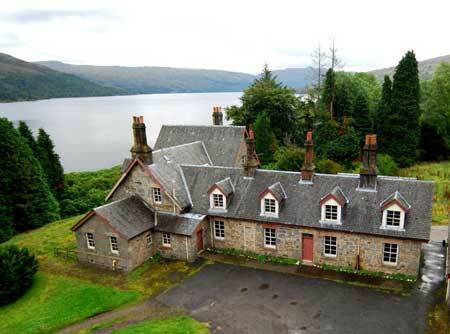 A house built on the shores of Loch Katrin to shelter Queen Victoria from the elements is being sold by Scottish Water. The C-listed Royal Cottage, which has spectacular views over the loch, was built for Queen Victoria by the former Glasgow Water Works Corporation to accommodate her when she officially opened the Loch Katrine Water Scheme in 1859, which brought drinking water and health to the people of the city. Located near the village of Stronachlachar in Stirlingshire, and in the Loch Lomond and Trossachs National Park, Royal Cottage was built in about 1857. It had originally been planned that Queen Victoria would be catered for in mobile accommodation for the official opening two years later. But Royal protocol insisted that a house be built for her. However, she never actually stayed in it. It is believed that during the official opening, a 21-gun salute marking the occasion shattered the house’s windows and made it unfit for her to stay in. The damage meant she was able to use the cottage only for shelter from the weather at the opening of the scheme when, history records, it rained. In recent years, the house has been used by Glasgow councillors as holiday accommodation and for Scottish Water staff accommodation. Mr Geoff Aitkenhead, Scottish Water’s asset management director, said: ‘We are delighted to be offering Royal Cottage for public sale. The house has great appeal because of the building itself, and its beautiful setting, but we believe the fact that it was built for and used by Queen Victoria will make it even more attractive to potential buyers. The cottage, which has been empty for several years, is in need of total refurbishment and is being sold at offers over £325,000 by CKD Galbraith. Outside, the property is surrounded by extensive grounds and a range of traditional outbuildings, including a cart shed, former laundry house, stores and generator shed. The property also includes A-listed railings along the perimeter of the land near the loch shore. Rod Christie, managing the sale for CKD Galbraith (0141 953 3081), said: ‘Royal Cottage offers a fantastic opportunity for discerning buyers to purchase a little piece of Scottish history. The property currently offers three separate homes, great for those entertaining guests in need of overnight accommodation or as a potential holiday lettings business.